In the 1970s, I was aware of an old lantern slide in the Royal BC Museum ethnology collection that I later identified as a Songhees First Nation. I based my information on the original field portrait catalogue of Paul Kane – created when he was at Fort Victoria in 1847 (Harper 1971:315-317). I did not know at the time the original sketch was missing, and this seemed to be the only image of it. Figure 1. Photograph of a missing sketch by Paul Kane, 1906. Charles Newcombe. PN17161. Figure 1, is No. 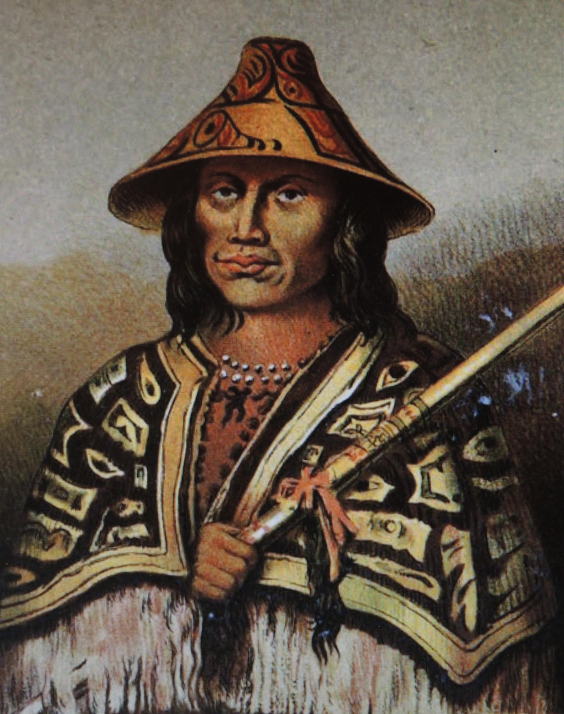 46 in Paul Kane’s portrait log: “Ska-tel-san – a Samas Tillicum with a (grass) hat that is much worn here south of de Fuca”, and in his Exhibition of 1848 he is listed as: “124 Sca-tel-son – a Songhes Indian, Vancouver’s Island” (Harper 1971:316 & 319). A painting in the Royal Ontario Museum (ROM912.1.870) was made from this original sketch. Harper was led into miss-labelling the latter as “A Babine chief” (1971:265). There was a mix-up of information during exhibits of Kane’s work, where various writings and collection lists, rather than his original accurate field logs, were used as source information. Incorrect identifications in publications of Kane’s friend Daniel Wilson also contributed to the confusion in names. Figure 2. Lithograph of painting of Sir Daniel Wilson, Published in 1862. Lister in his Paul Kane/the Artist/: Wilderness to Studio (fig.58; 2010:301) and again in his editing of Wonderings of an Artist Among the Indians of North America (Plate 60; 2017: 242-243) labels this later painting (ROM912.1.87) as “A Babbine Chief. Tsimshian. Skeena River region, northwest British Columbia.” He records that the description is based on “A list of Pictures sent to Mr. G.W. Allan, March 6, 1856”. Harper’s speculation on this painting in his Catalogue Raisonne IV-587, is correct: “This canvas is probably based on an unlocated sketch. When lithographed for the frontispiece in the Wilson book, Prehistoric Man, the title was changed to “Chimseyan Chief” (Harper 1971:308). Figure 2, shows a lithograph of a painting by historian and artist Sir Daniel Wilson copied from the missing Paul Kane original. This did appear in volume I of Wilson’s 1862 publication. In the third edition (1876) of Volume 1, of Wilson’s Prehistoric Man, this person is noted as “Kaskatachyuh, a Chimpseyan” Chief”, where it is noted that Wilson drew it “from sketches by Paul Kane”. Wilson, in discussions about what are obviously Haida argillite pipes, refers to them as those of the “Babeen Indians”, and mentions, mistakenly (in the second part), that they are: “from a drawing made by Mr. Kane, during his residence among the Babeen Indians” (Wilson 1857:42). Paul Kane never went to the northern coast of British Columbia, and First Nation visitors from that region did not come to the Victoria area until after Paul Kane’s visit. A few First Nations from the central and northern coast of British Columbia did work at the Hudson’s Bay posts, but there is no indication that these were the source of Kane’s sketches. In the mid-19th century, accurate writing about the First Nations of British Columbia was lacking. Kane’s historian friend, Daniel Wilson, kept current with the ethnographic literature of the times, such as the writings of geographer and ethnologist Henry Schoolcraft, but often lumped unrelated groups together or got their geographic locations wrong. Wilson was likely a strong influence on the use of First Nation names in the Paul Kane writings and exhibits. This Songhees person in Wilson’s (1862, Vol. 1) frontispiece, is also the same person, but from the original Kane sketch in reverse image in my book (Keddie 2003:3). I have since realized that lantern slide RBCM PNH104 was mistakenly photographed in reverse. I have identified the person as Sketlesun, a Songhees from the old Cadboro Bay village. He is the 6th person on the Che-ko-nein treaty list of 1850. 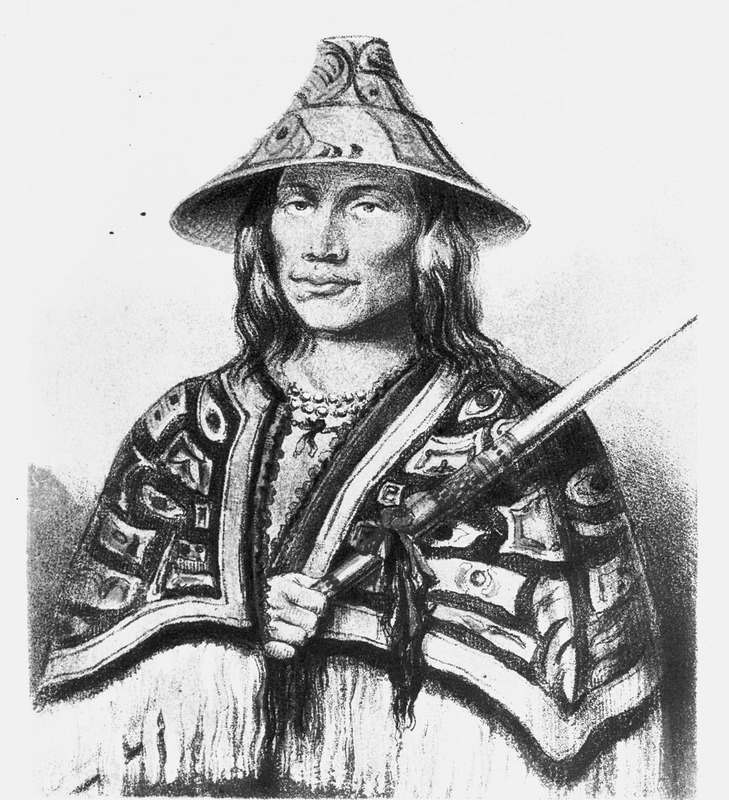 Because Sketlesun is wearing a Chilkat blanket and northern style hat, this image has been mistakenly labelled as a “Tsimshian chief” (Keddie, 2003:30). This style of Chilkat blanket was a valuable and high status trade item in the mid-19th century. Kane had purchased his own Chilkat blankets (see Lister 2010), but used designs from at least two different ones in his portraits. In 1906, Charles Newcombe took, at least twelve, photographs of Kane paintings. In regard to three of these (not figure 1) that he published, he notes they are: “reproduced by kind permission of E.B. Osler, Esq, M.P., of Toronto, who owns the originals” (Newcombe, 1909:53). He also acquired copies of paintings that were used in Daniel Wilson’s, two volumes – Prehistoric Man: Researches into the Origin of Civilisation in the Old and the New World (Wilson 1862). Wilson made copies of several of Kane’s sketches for use in these and other publications. I have now found the original negative from which Newcombe’s lantern slide was made (RBCM PN17161). Newcombe seemed to accept the naming of this image as Tsimshian because of the cape – not having access to Kane’s field catalogues at this time. It is clear that the photograph taken by Newcombe of Kane’s No. 46 portrait is a photograph of what Harper referred to as Kane’s “unlocated sketch”. I do not know where the original is, but this photograph might lead to its re-discovery. Edmund Osler had much of his collection on loan to the University of Toronto from 1904, until it became part of the Royal Ontario Museum collection in 1912 (Harper 1971:35). We know that in 1906 Charles Newcombe was in Montreal visiting “Dr. Lowe” to see his collection on June 2, and the next day visited the Red Path Museum. On June 10, he was in New York and around that time visited the Field Museum of Chicago. Somewhere after Newcombe took photographs of the collection(s), the sketch of the Songhees man named Sketlesun, referred to in Kane’s portrait log, disappeared or lies unidentified in some collection. Harper, Russell J. 1971. Paul Kane’s Frontier. Including Wanderings of an Artist among the Indians of North America by Paul Kane. Edited with a Biographical Introduction and a Catalogue Raisonne by J. Russel Harper. The Amon Carter Museum, Fort Worth, and the National Gallery of Canada, Ottawa, University of Toronto Press, Toronto. Keddie, Grant. 2003. Songhees Pictorial. A History of the Songhees People as seen by Outsiders, 1790-1912. Royal B.C. Museum, Victoria. Lister, Kenneth R. 2016. (Editor) Wonderings of an Artist Among the Indians of North America by Paul Kane. Royal Ontario Museum. Lister, Kenneth R. 2010. Paul Kane/the Artist/: Wilderness to Studio. Royal Ontario Museum Press, Toronto. Newcombe, Charles. 1909. Guide to Anthropological Collection in the Provincial Museum, King’s Printer, Victoria, B.C. Wilson, Daniel. 1857. Pipes and Tobacco: An Ethnographic Sketch. Lovell and Gibson, Toronto. Wilson, Daniel. 1862. Prehistoric Man: Researches into the Origin of Civilisation in the Old and the New World, McMillan, Cambridge.